Home prices up in August -- can it continue? Home prices up in August — can it continue? U.S. home prices rose in August for the third straight month! This rapid pace of recovery surprised economists and raised questions about how long the trend can last. After the steep three-year descent, prices bounced back over the summer at an annualized pace of almost 7 percent, the Standard & Poor’s/Case-Shiller home price index showed Tuesday. A measurement of home prices in 20 major cities. What did this index indicate? Prices climbed 1 percent from July. Prices were down 11.4 percent from August a year ago. Annual declines have slowed since February. Yup. Sure is. Due to the fact that rising home prices is key to rebuilding the economy, as homeowners feel wealthier when their property appreciates in value and will thus have the tendency to spend money. Further, higher home values help homeowners who owe more to the bank than their homes are worth. 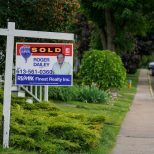 The gains in U.S. home prices in recent months may not be sustainable and increases in some areas of the country appear to be in “bubble territory,” an economist known for his property market expertise said on Tuesday. Robert Shiller, an economics professor at Yale University and co-developer of Standard and Poor’s S&P/Case-Shiller Home Price Indices, told Reuters Television he does not give quantitative forecasts on where home prices are headed but is concerned about the recent pace of increases.